View More In Fruit & Nuts Gifts - Page 4. Just the right' sized gift to send to let someone know you're thinking of them. A BEST SELLER at $29.99! 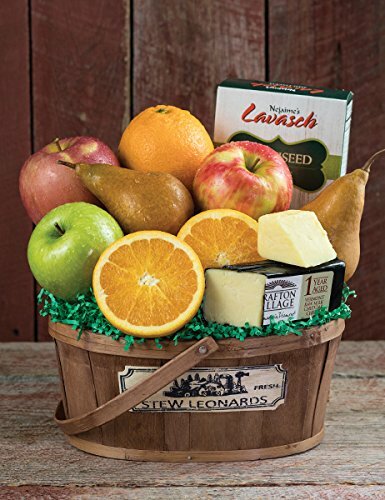 Our most popular fruit basket includes our favorite types of apples as well as oranges and juicy Bosc pears. We also include a creamy, rich, farmhouse cheddar cheese from Grafton Village, VT and pair it with all natural, multi-seed flatbread crackers, so you can send some of Stew's favorites to family and friends. Includes Honeycrisp, Granny Smith and Fuji Apples, Bosc Pears, Oranges, Vermont Cheddar Cheese and Multi Seed Flatbread. Our Best Selling Fruit Basket! Delicious variety of FRESH fruits and cheese. If you have any questions about this product by Stew Leonard's, contact us by completing and submitting the form below. If you are looking for a specif part number, please include it with your message.